General chat and server information. Bumping this as all content patches are going to the test code base only. The further the testing the better the result will be when this goes live. By the way everyone I will give out gold gm tokens for valid bug reports on live and 2 gold tokens for valid bug reports from the test server! They need to be real valuable reports not, "Item is using the wrong graphic" or "I think this should have more hate"
Instead things like, "This mechanic is working on live but totally broken on dev, here is the example and how to reproduce. Here is some research I have done to show its in era"
1.After install and you log in for the first time it does not automatically Direct you to a new server aka quick connect. Maybe we can disable this button as a whole. 2.Client isnt calculating the Correct HP value on AA: Physical Enchancement, seems to be less than 1%. I believe it should be 3%. 3. AA Planar Durablity is granting more than 1.5% HP per a rank Should be 108 HP for my base HP. it was givign me 133 HP. 4.Combat Stability seems to not be mitigating damage. Can this get a second look? 6.Per our conversation I attempted to connect to the live server and was met with a black screen of death 6/6 attempts. [Mon Feb 11 18:29:10 2019]00028:Loading string tables. [Mon Feb 11 18:29:11 2019]00030:8410 strings read. [Mon Feb 11 18:29:11 2019]00031:Initializing client variables. [Mon Feb 11 18:29:11 2019]00033:INI file .\defaults.ini loaded. [Mon Feb 11 18:29:11 2019]00035:INI file .\VoiceChat.ini loaded. [Mon Feb 11 18:29:11 2019]00036:Loading spell effects. [Mon Feb 11 18:29:11 2019]00037:Initializing display structures. [Mon Feb 11 18:29:11 2019]00038:Sound Manager loaded 2994 filenames from soundassets.txt. [Mon Feb 11 18:29:11 2019]00039:Voice Manager loaded 12 macros from VoiceData.txt. [Mon Feb 11 18:29:11 2019]00041:Networking: using port . [Mon Feb 11 18:29:11 2019]00043:WorldAuthenticate: Initiating Login. 2.Client isnt calculating the Correct HP value on AA: Physical Enchancement, seems to be less than 1%. I believe it should be 3%. AA Values have not been modified, but I will look into it. 3. AA Planar Durablity is granting more than 1.5% HP per a rank Should be 108 HP for my base HP. it was givign me 133 HP. AA Values have not been modified, but I will look into it. 4.Combat Stability seems to not be mitigating damage. Can this get a second look? AA Values have not been modified, but I will look into it. 5. Combat Fury im not sure what the meleecritfactor is currently on test but I feel its a bit to high. Warriors should be at at 13 crit. After parsing I was only at 7.2% AA Values have not been modified, but I will look into it. Are there commands that we can use on the test server? I logged on the other day but was totally naked. Giving myself clothes and some AA would make it a lot easier to do some testing. There are a bunch of commands, I think typing #help will give you a list of them, generally they're all formatted #<command> <argument>. Some of them won't be enabled, but the ones you need to get set up and test some things will be. 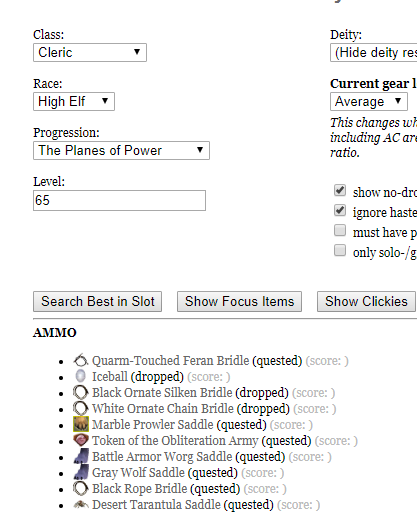 Looked at EQitems.com for best in slot. Use 128413 to summon yourself the item in game. I realize we are supposed to be testing content on "Test", but it is REALLY fun to be able to summon ANYTHING YOU WANT! It's been a while since I've been on test, and I don't remember the # command atm. I'll edit this later when I either remember or look it up.